Henri Matisse was one of the greatest artist from the beginning of the XXth century. Born in the North of France, in 1869 in Cateau-Cambrésis, he was the leader of the Fauvism movement. His influence over all the modern and contemporary art is incredible : from Picasso, who considered him as a friend and equal in painting to Andy Warhol who said that he wanted to “be Matisse”. The color is not the only quality of Matisse’s art, the line, the drawing are important parts of his work. When he did not paint landscapes or still-life images, the painter cherished human representation. With a simple but insured line, the artist sketched easily delicate faces. 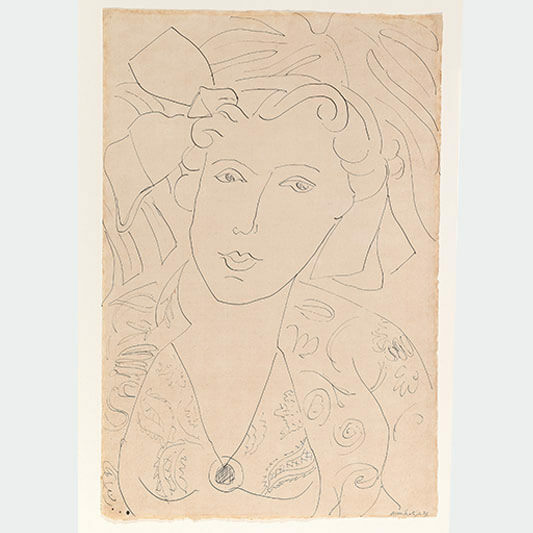 Representation of the woman body is one of the most fascinating aspects of Matisse’s art. He drew them in crazy dance scenes, in luxuriant landscapes or posing lasciviously in oriental interiors just like Ingres’s odalisques.